Is the Islamic State Establishing Itself in Qalamoun? A military confrontation is building up between two powerful jihadist factions, the Islamic State and the Nusra Front, in southern and southwestern Syria and as the balance shifts, the Islamic State stands poised to grow in new regions. A military confrontation is building up between two powerful jihadist factions in southern and southwestern Syria. The al-Qaeda aligned Nusra Front and its principal jihadist rival, the so-called Islamic State (also known as ISIL or ISIS), have fought a bitter war since early 2014, but farther south there has been less tension, partly because the Islamic State has not had a strong presence outside northern and eastern Syria. Now, however, that balance may be shifting, as demonstrated by a series of armed clashes in the Qalamoun region and even in the southern province of Daraa. Clashes began on November 27 in Bir al-Qasab in the eastern part of Qalamoun, a swathe of territory stretching from northeast of the capital Damascus toward the Lebanese border in the west. Bir al-Qasab is seen as a gateway to the eastern suburbs of Damascus and to the Hauran region further south, around Daraa. In mid-December, the Lebanese press also reported fighting at Ras al-Maara in western Qalamoun, only a few kilometers from the Lebanese border town of Arsal. Arsal has itself been the site of repeated clashes pitting the Lebanese Armed Forces and Hezbollah against the Nusra Front and other Syrian rebels. In these battles, the Nusra Front has been supported by the Islamic State, but this is an exception to the rule. In western Qalamoun/Lebanon region, local commanders have steered away from confrontation, even as the two jihadist groups try to eliminate each other elsewhere in Syria. However, tension now seems to be increasing after reports that the Islamic State has begun demanding that other Qalamoun rebels must pledge allegiance to it. Once the winter snow that normally hits the Qalamoun region recede, whoever ultimately wins will certainly step up their pressure on regime forces in the Damascus area and on Lebanon. According to the Lebanese al-Akhbar daily, the fighting for Bir al-Qasab initially involved not the Islamic State, but armed Bedouin smugglers headed by Mohammad al-Mukahhal (a.k.a. Abul-Moutasim). In this telling, Mukahhal adopted the Islamic State label in the hope of gaining its protection. The fact that the Islamic State’s information office in the Damascus area made a show of announcing that the organization was sending supplies to the fighters in Bir al-Qasab—nearly two weeks after the start of clashes—lends weight to the claim that it had not already been present at the outset. But this also means that the Islamic State is now committed to the battle. The stage appears to have been set when the Nusra Front and five other rebel factions in eastern Qalamoun formed joint command structures on November 25. Besides the Nusra Front, the list included the Martyr Ahmed al-Abdo Battalions, the Islam Army, Ahrar al-Sham, the Rahman Corps, and the Lions of Sharqiyyeh. According to an Islam Army source, the joint structures comprise “a sharia committee whose power extends over all territories of eastern Qalamoun, a unified command council, and a joint military operations room.” The clashes that broke out at Bir al-Qasab, which lies on a major smuggling route to Jordan, may have been an immediate attempt by the new joint command to assert its authority in the area and secure its arms supply. However, while reiterating the common commitment to “bringing down the Syrian regime,” the Qalamoun rebel coalition also made clear that its main aim was to fight the “khawarij of this age,” a pejorative term for Muslims holding extreme doctrinal views that is now used by Syrian Islamist groups to describe the Islamic State. A leading member of the Islam Army, Captain Islam Alloush, describes regime and Islamic State operations in the region as overlapping: while the former maintained its tight siege around the eastern Ghouta area of Damascus, which is suffering growing shortages of food and fuel, the Islamic State was choking the area off at Bir al-Qasab. It remains unclear whether the Islamic State has gone beyond supporting Mukahhal’s men to investing its own combat manpower at Bir al-Qasab. The local Nusra Front emirs apparently believe that the Islamic State will use the area to stage further attacks elsewhere, but they are divided over where they expect the blow to come. An emir in the besieged eastern Ghouta, Abu Muhjin al-Shami, expects the Islamic State to target the area. In the murky world of intra-rebel rivalries in the enclave, the recent death of two leading Nusra Front members has been interpreted by some as an effort to purge suspected Islamic State sympathizers within the Nusra Front’s own ranks. The fear of infiltration and defections is genuine given that the Islamic State maintains a presence in nearby al-Hajar al-Aswad and recently claimed that 200 rebels in southern Damascus have switched sides to join it. However, in early December a leading Nusra Front figure in southern Syria, Abu Maria al-Qahtani, said he expected the Islamic State to make a bid to establish itself in Daraa Province. Here, too, a covert struggle has resulted in several assassinations of local rebel commanders, among them Ahmad Kassab al-Masalmeh, a former associate of al-Qaeda’s Osama bin Laden and Ayman al-Zawahiri. Masalmeh had returned to Syria to join the anti-Assad struggle in 2012 along with fellow jihadist Abu Khalid al-Suri. The Islamic State, which killed Abu Khalid in January 2014, was probably responsible for Masalmeh’s death on November 11. In the following weeks, some jihadist media alleged that the Islamic State had secretly gained the allegiance of several groups in Daraa, including Saraya al-Jihad, the Tawheed al-Janoub Brigades, and the Yarmouk Martyrs Brigade. 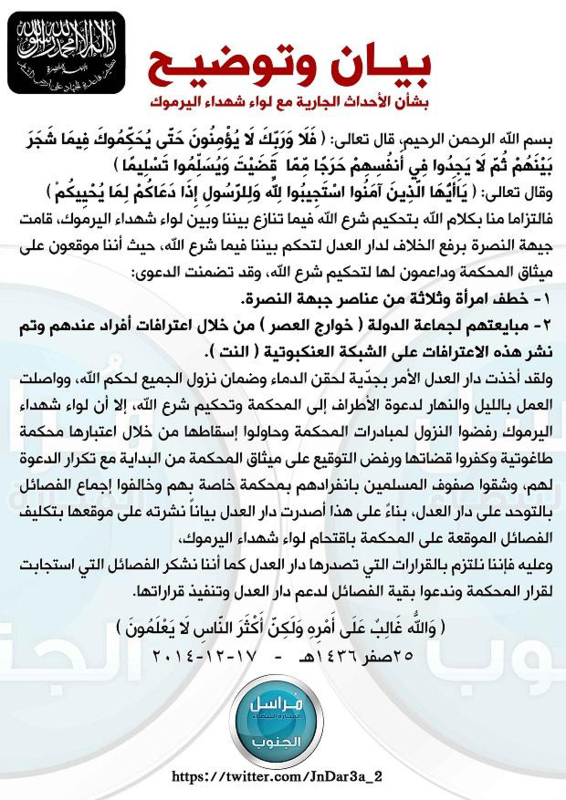 While the Yarmouk Martyrs Brigade (not to be confused with a much-larger Daraa-based group formerly known as the Yarmouk Brigade, now the Yarmouk Army) denies having pledged allegiance to the Islamic State, the Nusra Front insists that there is a secret relationship after interrogating captured members. In mid-December, the Nusra Front went on the offensive against the Yarmouk Martyrs Brigade. It justified its action by claiming it was combating corruption, exactly as it did when it expelled the Saudi- and American-supported Syria Revolutionaries’ Front from the northwestern province of Idlib in November. A fragile truce was reached on December 16, but the Nusra Front is likely to face a more direct challenge from the Islamic State soon, as two other groups in Daraa, Bait al-Maqdis and the Abu Mohammad al-Tellawi Battalions, reportedly pledged allegiance to the Islamic State in the first half of December. Defections to the Islamic State now threaten the Nusra Front’s stronghold in western Qalamoun. The clashes that broke out on December 12 at Ras al-Maara near the Lebanese border pitted the Nusra Front against the Abu Abdessalam group, a local rebel faction that had “gone over” to the Islamic State, rather than infiltrators from Islamic State–held areas. A local Islamic State spokesperson in the area, Abu Musab Hafid al-Baghdadi, in fact claimed that most local factions had already pledged allegiance to his group. And on December 17, the Islamic State overwhelmed the Maghawir al-Qusayr Battalion and executed its commander. The Nusra Front is in an increasingly delicate position. According to well-connected Lebanese media, the Islamic State’s religious scholar Abu-Walid al-Maqdisi visited western Qalamoun in early December to notify the Nusra Front’s local commander, Abu Malek al-Telli, that the Islamic State intends to extend its “caliphate” to the area by mid-January 2015 and to demand his vow of allegiance within ten days. Another source reported that Abu Malek has agreed to remain neutral in any conflict between the Islamic State and other factions in the area, after being threatened by some of his own senior officers. If these reports are true, then there are several implications. Once the Islamic State has absorbed or eliminated the remaining smaller rebel groups in western Qalamoun, it will likely seek to do the same to the Nusra Front’s local contingent, thereby assuming overall leadership over the fight against the Lebanese Armed Forces and Hezbollah. Whatever happens here may have a domino effect on eastern Qalamoun, where the Nusra Front’s ability to deter other rebel groups from defecting to the Islamic State may crumble, ultimately compromising its own presence in the area. The Nusra Front can resist more effectively in Daraa, where factions hostile to the Islamic State are relatively strong and benefit from international support via the so-called Military Operations Command in Amman. But with the steady trickle of defections to the Islamic State continuing both in the south and in Qalamoun, the balance may start to shift there too. At the very least, the Islamic State stands poised to grow in new regions, without transferring fighters from its strongholds in eastern and northeastern Syria.